This past weekend, two worlds collided as Tech N9ne and Avenged Sevenfold met in Kansas City during their Uproar Festival performance. Taking a night away from the spotlight, Tech N9ne attended the show as a fan and took part in the full experience, which included the Kansas City King actually purchasing Avenged Sevenfold merchandise and later getting it signed by the band. Fans may recall that Tech N9ne had recently praised the heavy metal outfit over Twitter and had shared his excitement in seeing them live. 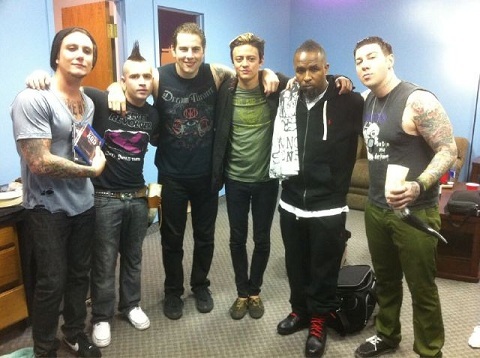 Avenged Sevenfold fan site DeathBatNews.com picked up on the story and shared it with Avenged Sevenfold fans who were very receptive to the band working with Tech N9ne. As Tech N9ne looks to push Strangeland deeper in the world of music, fans may be in for yet another big surprise. Do you think this will lead to a collaboration? Leave your thoughts below!